The Sandman Hotel Group will transform RGU’s former city centre base into a four-star hotel. A leading developer has announced plans to spend £20m building a four-star hotel in Aberdeen. The Sandman Hotel Group will transform the Robert Gordon University's former St Andrews Street base into a 220-room hotel, creating around 150 permanent jobs. 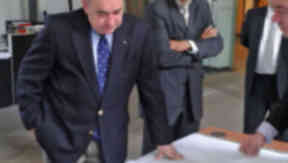 The news was welcomed by First Minister Alex Salmond, who said the development would benefit tourism in Aberdeen. Mr Salmond said: “This announcement by the Sandman Hotel Group is excellent news for Aberdeen’s tourism industry. “While this new hotel will undoubtedly benefit business tourism in the Aberdeen area, visitor numbers from overseas markets continue to grow. “The Sandman Hotel Group has seen the golden opportunity Scotland presents and I’m delighted to see them investing upward of £20 million in their new hotel. The hotel will include 61 one-bedroom suites, a restaurant and convention facilities. The university said the sale of its St Andrews Street building would allow it to continue development of its new Garthdee campus. RGU principal professor Ferdinand von Prondzynski said: “The sale will provide major benefits to the city as well as RGU. “The capital received will allow us to continue with the development of our teaching and learning facilities, providing our students with an outstanding educational environment.